How Many Giveaway Entry Options Should You Use? Last week, a post was published on our blog regarding Rafflecopter giveaways and the number of entry options you prefer from a giveaway admin perspective as well as an entrant perspective. 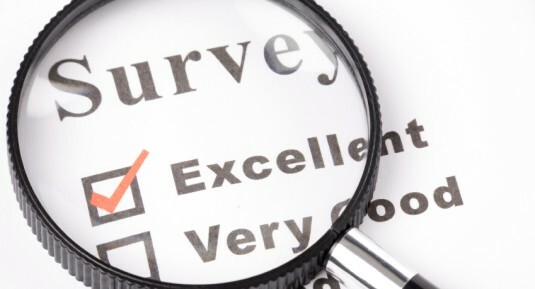 Today, we’ll share with you the results of the survey. We’ve included some more in-depth analysis regarding the number of entry options and some advice on how to make the giveaways you run more pleasurable for your entrants. The Survey: What Was Asked? Admins: how many entry options do you use in your giveaways you manage? Entrants: how many entry options do you enjoy in the giveaways you enter? We’ve broken down the results below in two sections of results: administrators who use Rafflecopter to run giveaways and those who interact with Rafflecopter as a giveaway entrant. In the survey, respondents were asked if they run giveaways using Rafflecopter. If answered yes, they were asked if they could characterize themselves as a blogger, a business, or both. How Many Entry Options Do You Use In Your Giveaway? First, let’s look at everyone who has run a giveaway using Rafflecopter as represented by the blue column. 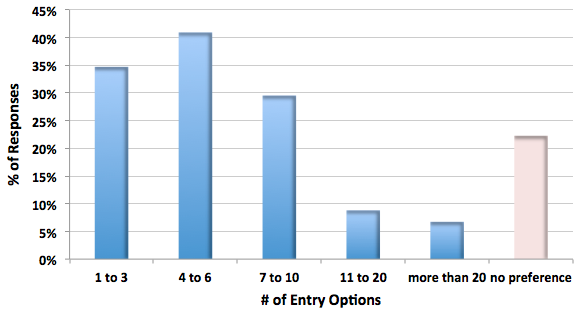 Two-thirds of all respondents use a total of 10 entry options or less, while most prefer to run giveaways with between 4 and 10 entry options. Next, look at those who run giveaways specifically as a blogger as represented by the red column. 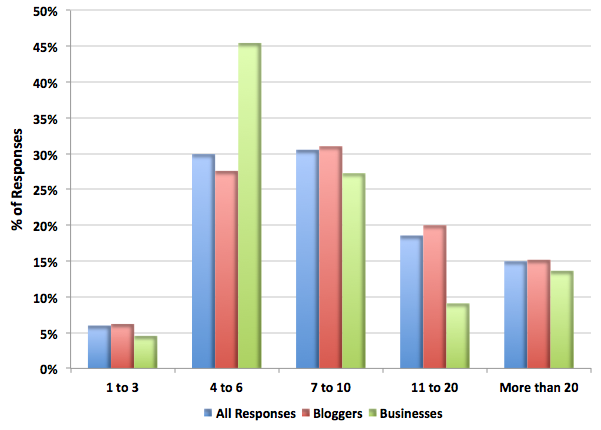 Bloggers typically use more entry options than businesses would. This could be because bloggers will often run giveaways alongside a brand they are working with and have entry options for both their blog as well as the brand they’ve partnered with. Blogs who use Rafflecopter might run a giveaway as part of a group effort, working with one, two, or a handful of other bloggers. Finally, look at those who run giveaways specifically for their business as represented by the green column. 80% of businesses using Rafflecopter use less than 10 entry options, with a large majority (46%) of those using between 4 and 6 entry options. When we run a giveaway on the Rafflecopter blog, whether it be our own or a brand showcase, there are usually between 4 and 7 entry options. I don’t like to give people too many options. If you give people too many options, they don’t act. Here is a great example on the NYT regarding too many choices. I find providing too many options is disorienting and detracts from the original purpose, which is to enter the giveaway. I like to have as many entries as possible. I always offer entries that once the entrant follows me on a certain network or subscribes to my emails they will always be eligible for that entry. To me this is like giving the readers a bonus for reading my blog and taking the time to try to win a giveaway. Short and sweet is supreme. After getting feedback from my readers, I found that keeping the total entries fairly minimal is best. I have standard optional entries promoting the company’s social media outlets, my social media outlets, and subscriptions. Then daily tweets. Simple is better. I do not care for giveaways that have a lot of entry options so I do not subject my followers to jump through hoops just to win something. I do not want to chase them away. As a blogger, we need to be able to include entries for our social network site as well as the prize sponsors sites. If not, then neither of us truly get the benefit we are looking for from the giveaways. If limited on how many entries we can have, many bloggers will be looking for a new way to run our giveaways to ensure that we can still accomplish this goal. Respondents were asked if they enter giveaways using Rafflecopter, how many entry options do they enjoy? They were asked to check all that apply. An overwhelming majority of entrants enjoy giveaways with less than 10 entry options, while 22% of those had no preference. About 16% of respondents said they enjoy giveaways with more than 10 entry options. As I stated above, I don’t like spending too much time on a giveaway with tons of entry options either. These type of giveaways make me break away… I think less is more. I like to keep it simple. I don’t mind entering a few more, as long as it isn’t some huge list of things to click and do. Then, I won’t even bother! I have no preference. When I enter giveaways, I love the choice to enter how I want. The more choices we have the more chances we are likely to have an entry we can actually accomplish and feel as if we do not have the requirements for one, we still have back up. I answered no more than 10. I hate giveaways with a ton of entry options! How much time and patience do they think I have? I like to enter giveaways, but I want to have a fair shot at winning. I simply don’t have time to enter more than 10 ways in one giveaway. If others with more time are entering 20 or more ways then I usually don’t even try. Seems like a waste of time. Anything over 10 entry options is way too much fuss. My thought at that point is the person running the giveaway is just making the entrant jump through far too many hoops to win a prize. I answered more than 20 entry options & no preference. Does not make a difference to me, but more chances of winning. 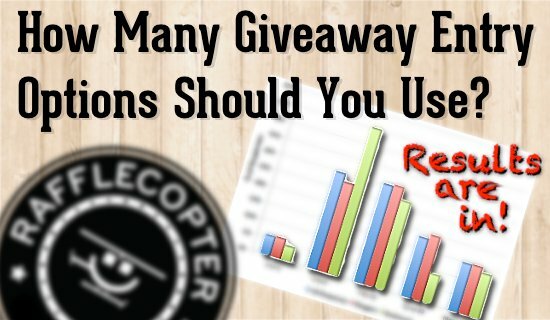 To help us understand how Rafflecopter is being used, we measure how many Rafflecopter giveaways are created along with how many entry options are in each. Below is a graph that charts all giveaways created since March 1st, 2012 along with the number of entry options each giveaway had. Giveaways with 5 to 7 entry options are very popular. About two-thirds of the Rafflecopter giveaways created have 10 or less entry options, while 95% of the giveaways created have less than 25. About 3% of the giveaways created with Rafflecopter since March 1st had greater than 25 entry options. Below is a graph that places both the giveaway entrant and administrator on the same page as per the survey responses shared above. 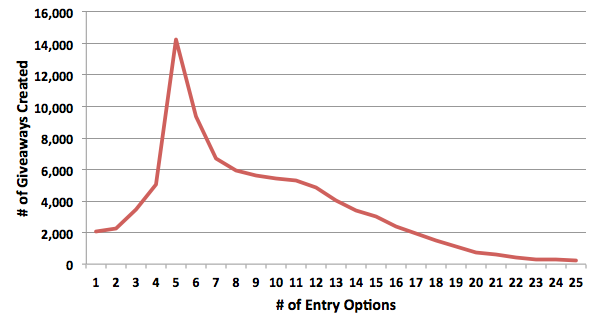 If the above graph tells us one thing, it’s that giveaway entrants would prefer a few entry options less than what giveaway administrators use. This shouldn’t come as a surprise. If you surveyed all grocery stores and their customers, I’m sure that customers would want everything to be free while the stores would like to make more revenue. Admins: If you’re running a giveaway, you’re doing it to gain something. It could be increased site engagement, an increased number of followers, or maybe an increased level of happiness of your audience. Speaking for ourselves, we run giveaways to increase readership to our blog and to awareness of new Rafflecopter features as well as brands we support. 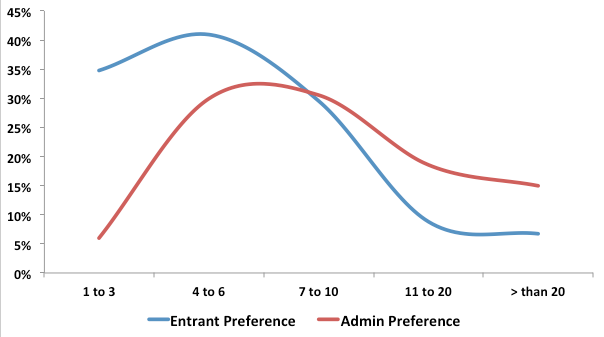 Conclusion: On average, admins want more entry options in their giveaways than entrants would prefer in hopes that more actions are performed per entrant. Admins and entrants are both important parts of the giveaway ecosystem. However, if you’re an admin, remember that you have the upper hand. How the giveaway is set up and administered is under your control and completely up to you. There is a balance that must be met. So to all admins out there: find the middle ground that not just satisfies your requirements as a blogger, but also makes your readers happy. Like a fingerprint, each of your blog and brand audiences is unique; only you know them best. 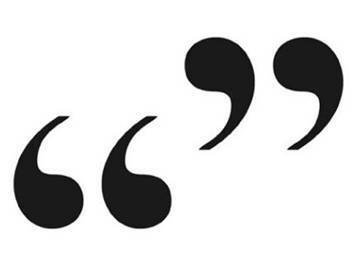 Ask your readers what they prefer. Try cutting down on entry options & focus on the social networks that matter most to you and your audience in your giveaways. You might be surprised at the results! How many entry options do you prefer? Let us know in the comments below! Thanks for the updated stats. It’s good to know what others are doing as well as what people are expecting. Awesome stats Greg! One more variable – what is the prize worth? If the prize is $20 or less, it seems odd to make people jump through all the hoops. If the prize is something totally AWESOME, people may not mind spending a little more time filling out all the entries. That would be great to find out what they’re willing to do for what type or value of a prize. Thanks for sharing these results Greg! I’m glad you guys decided to take this survey so we can see it from 2 points of view! thanks Alice :) happy to share! I feel like I am seeing lots of rafflecopter giveaways with TONS of entries. I would love to typically find the ones offering 10 or less options. I seem to run into a lot used to garner entries over 20 or more blogs which could take nearly an hour to enter by the time you follow them all on twitter, facebook, confirm facebook and twitter, subscribe to emails, etc. I love your product! I wish some bloggers didn’t use it the way they do. Interesting. I think 4-6 is too perfect! Sponsors like to see a lot of entries to the giveaways. If a blogger can brag that she got 10,000 (or more) entries to a giveaway, that makes brand sponsors salivate. But the truth may be far different. I’ve seen bloggers award high numbers of entries for a simple action, so it inflates the number of “entries”. The best ones, IMO, only require a simple click to enter. Yeah, the number of entries is lower, but everyone has a fair chance to win and you get a more accurate count of interested readers, not some inflated figure. I love the graphs! Thanks for all this info on the results! I think it’s important to remember that not every giveaway is the same, either. On average, I think I use the 5-7 range (as a blogger). And as an entrant, that’s good for me, too – enough choices that if one or two don’t work for me, I still have something left, but not overwhelming (esp. if several of these are social media follows that, once done, are good for future giveaways, too). BUT on occasion I run a giveaway that is different than my usual. A composite giveaway, for instance, with prizes from multiple sponsors. In this case, the number of entry options is going to go up, because each sponsor will be represented in the options. I like to think that readers are reasonable enough to consider that a fair trade-off for the opportunity to win multiple prizes. I may have to restructure my giveaways. Good info. Thanks. I have entered way to many giveaways with several more entrys than 10 on their Rafflecopters. The trend also seems to be getting higher. I would think that they should diversify their giveaway requirements each time rather than adding more entrys the next time they have a giveaway. I’m just glad you posted your data here so I know there are people out there who have other opinions on what is correct and fair. I only ever give two entry options – three at the very most. I find the convoluted entries annoying, and never enter comps that require me to jump through hoops. In my experience busy Mums don’t have time to complete 5/6/7 entry requirements – just for a chance at a prize. I like to keep it as quick and simple as possible. I am seeing rafflecopter giveaways on blogs with 6 to 10 entries, but on each entry you must follow 10 blogs, 10 facebook pages, etc. I saw one giveaway that easily had 15 to 20 entries and each one of the buttons had a list of 10 to 20 pages or blogs or twitters to follow, like, subscribe to. I am sorry but as an entrant I skip them all together. I am not a blogger or a business just a person who likes to enter contests for things I like. I hope someone will convey the message to the multi blogger giveaway sponsors that they are starting to lose readers. Up to 5 or 6, any more and I don’t usually bother. I particularly hate the joint give aways on blogs and facebook where you have to like and follow about 8 people, on every social media site! NEVER do those, so I think they loose a lot of followers that way. Less is best! I’m going to return to a blog that had say, four options, many more times than I would return to one that had ten. That being said, I also want to patronize a blog that I’m interested in reading. And, like you said, I only want to enter giveaways that are a real benefit to me, like giftcards, food, etc… Thanks for the article; it was interesting! I’m so not savvy at all this stuff but wanna win so in need of help!! I love rafflecopter giveaways. The UI is so easy and simple to use!!! My kids are my lucky charm!